"The Heart Attack" is the thirteenth episode of Seinfeld. The episode was the eighth episode for the show's second season. It aired on April 25, 1991. George thinks he is having a heart attack but actually needs a tonsillectomy, leading Kramer to recommend a holistic healer as a better (i.e., less expensive) alternative. Jerry warns George that the healer Kramer is recommending had spent time in prison. ("The medical establishment, see, they tried to frame him," explains Kramer. "It's all politics.") 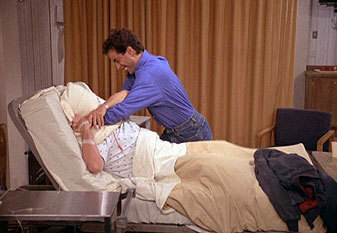 After comparing the cost of an expensive operation in the hospital ($4000–$5000), and the holistic treatment he would receive (Kramer says "First visit: 38 bucks"), George decides to go with Kramer's advice. Meanwhile, Elaine dates a doctor she met at the hospital. He shows off his knowledge of tongues by holding Elaine's tongue and pointing out the different parts of it. She is subsequently turned off. Jerry tries to decrypt a humorous note he wrote to himself in the middle of the night after watching a B-movie (starring Larry David), presumably that he was going to use in one of his stand-up segments later. George, Kramer and Jerry, who is only there for comic material, meet the holistic healer (played by Stephen Tobolowsky). Tor performs a number of unorthodox methods to determine George's real ailment, which he concludes has nothing to do with his tonsils, but with his imbalance with nature, claiming that the word 'tonsilitis' is Chinese for "an invasion of heat and wind". Tor also tells Jerry he is eating too much dairy products. Tor then concocts a tea containing "couchgrass," "cleavers," and "cramp bark" that would remove his ailment, also prescribing that George is to stop using hot water entirely. George starts drinking the tea, and in the next scene he is shown being transported by ambulance with a purple face, while screaming "I'm an eggplant!". The ambulance gets into an accident after the EMT and the driver get into an altercation over a missing Chuckle, that the EMT thought the driver ate. Later George and Jerry are found in the hospital in neck braces. George indicates that he had the tonsillectomy, and Elaine is in the hospital only briefly to give George some ice cream, indicating that she is avoiding "Doctor Tongue". George, unable to speak, tries to ask Jerry for ice cream. Elaine gives him ice cream, and Jerry sees the Larry David movie again. He remembers that what he wrote down, was what he heard in the movie, and he says, "That's not funny." The man on the other side of the curtain, who yelled at George earlier, tells Jerry to "shut up." George throws his ice cream at him.